The Create New User section displays. In the New username field, enter the person's user name. Type the person's first name and last name in the corresponding First Name and Last Name fields. If you want leave the field blank, enter a space. In the Type list, select the user type to define the type of work the user typically performs. This will restrict access to certain Harmony modules and operations in the Control Center—see . General users should be set to Animator, Xsheet, Scan or Ink & Paint so they can't delete environments, jobs or scenes. To set a password (recommended), select the Set Password option and enter a secure password in the New Password field. 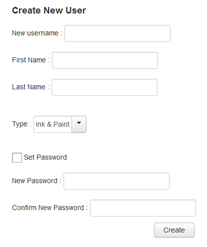 The user has the ability to modify the password later on. If you do not want the user to have a password, deselect the Set Password option and go to step 8.